This site receives 5-600 hits a day. If you are interested in advertising, please email info@wastesupport.co.uk. PLEASE READ THE INFORMATION BELOW TO FIND THE RIGHT CODE. FOR FURTHER SUPPORT, PLEASE EMAIL THE OFFICE OF NATIONAL STATISTICS OR, AS A LAST RESORT, CALL THEM ON 0845 601 3034. THE AUTHORS OF THIS SITE ARE UNABLE TO HELP WITH SIC CODES - PLEASE DO NOT TRY TO CONTACT THEM. PLEASE NOTE THAT FROM OCTOBER 2011, ANNUAL RETURNS FILED WITH COMPANIES HOUSE MUST USE SIC 2007. Companies House requires 5-digit codes. Where only a 4-digit code is provided, you should add a zero eg Manufacture of Motor Vehicles. On the ONS list, this is shown as 2910. On the Companies House list, this is shown as 29100. Use one of the options above to find the code you need. Where a 4-digit code is further broken down into 5-digit codes (using /), you should use one of the 5-digit codes. 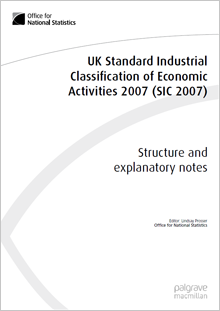 A full list of Office of National Statistics (ONS) codes and explanations are available for SIC 2007 and 2003. The SIC CODE for a CHARITY is normally 88.99 unless it is for a CHARITY SHOP in which case it would be the code for the retail activity. For more detailed information on the activities covered by each code, please look at the Explanatory Notes for each 2-digit Division. If you enter a 2003 code into the 'Look up and convert to 2007', it may say that the code is invalid. This because it is not shown on the ONS comparison of 2007 vs 2003 codes. You should therefore look for the right 2007 code by either searching by section or text. To search by text, enter an appropriate word that describes your activity eg vending. If it cannot find a heading with that word, it will suggest you look at the Explanatory Notes. Click on those words and it will offer a list of explanatory notes that contain the word 'vending'. If you manufacture vending machines, then click on the appropriate 2-digit code (28, in this case) and it will show the full list. Scroll down and you will find where the word 'vending' appears in a green box. This will show the code to be used (28.29 in this case). You may also find it says 'No further results available'. In this case, you could extend the search by only typing in part of a word eg. The word ‘charity' does not appear anywhere, but ‘charitable' does. Therefore, if you insert ‘charit', it would bring up a list of options. You also may find you need to use an alternative word if it does not recognise what you enter. It will not recognise ‘butcher' or ‘florist', for instance, but it will recognise ‘meat' and ‘flowers'. A code with 'n.e.c.' (Not elsewhere classified) in a description should only be used if no other appropriate code can be found. IF YOU HAVE NO IDEA WHAT YOUR COMPANY SIC CODE IS, YOU CAN DO A SEARCH FOR YOUR COMPANY DETAILS ON THE COMPANIES HOUSE WEBSITE AND IT WILL SHOW YOU THE CURRENT SIC 2003 CODE. FOR TRANSFER NOTES, YOU SHOULD THEN CONVERT THIS TO A SIC 2007 CODE BY USING THE CONVERSION FACILITY BELOW. However, there is no guarantee the code on Companies House is correct, so you should still verify the 2007 code if there is any duobt. Selecting the right code is the responsibility of the user and we can accept no responsibility for any incorrect code used. For any further information on SIC Codes, please read the instructions below or contact the Office for National Statistics on 0845 601 3034 or email classifications.helpdesk@ons.gov.uk. One code is associated to each business unit recorded in statistical business registers, according to its principal economic activity. The principal activity is the activity which contributes most to the value added of the unit. In the simple case where a unit performs only one economic activity, the principal activity of that unit is determined by the category of SIC which describes that activity. If the unit performs several economic activities, the principal activity is determined on the basis of the value added associated to each activity, according to the rules presented below. Value added is the basic concept for the determination of the classification of a unit according to economic activities. The gross value added is defined as the difference between output and intermediate consumption. Value added is an additive measure of the contribution of each economic unit to the Gross Domestic Product (GDP). For a complete explanation of how a code should be identified, please go to the UKSIC Explanatory Notes. The ONS Guidance Document includes some 25 pages of explanation on the rules for choosing the correct SIC Code. The SIC Search facility should therefore be used in conjunction with these rules, some of which are laid out under ONS Guidelines. For most sites, the activity that defines the SIC code that should be selected is the one that contributes the highest economic value to the site. To use the facility, there are three options. This enables the user to drill down through the system to identify the right code. The first drop down opens up the list of Sections. Choosing the appropriate Section then brings up a drop down with the 2-digit Divisions. Choosing the appropriate Division opens up another drop down which will list the 3-digit Groups. Selecting the appropriate Group will then provide all of the 5-digit SIC codes within that Group. You must then select the code that matches your activity using the criteria specified by the ONS. The ONS list SIC codes in a number of documents. This facility used the 2007 Summary of Structure spreadsheet which provides a description for every code, but does not provide the full list of examples that is provided in the Structure and Explanatory Notes. When entering a word or words, the facility will identify every 2-digit Division and 3-digit Group containing that word or words and will then list the relevant Divisions. You can then select the Division you feel best suits your siteâ€™s activities and that will then display all the relevant 5-digit codes. If no results are found for your search, the system will search for your words in the Explanatory Notes. It will then offer you the chapters that contain your search words. When you open these, the page will show your search words highlighted in green. You may look up a particular code to check the activity it relates to. By entering your 2003 or 2007 code in the two options available, you will be provided with the activity for that code and the appropriate 2007 or 2003 code. Â If you enter less than 5 digits, it will show all the codes within that larger grouping if there are any. You may enter codes either as a straight 4 or 5-digit code eg. 1391, 14142 or with the punctuations usually required by Government departments eg. 13.91 or 14.14/2. Some codes have been split or combined, so you may be given the option of more than one code.